Hidden inside the Starcross Nebula is a place of interstellar shipwreck. It’s like a Bermuda Triangle half as old as time. It harbors malicious monsters and dangerous mysteries. It’s a hell of a place to attempt a rescue mission. Captain Zilka Devreze and her crew on the starship Guardian Angel must race against time to find shipwreck survivors in mortal danger. They’ll use Zilka’s genius grasp of the intricacies of fast starflight to get in and back out again. Mission specialist Jack Mistry was an accident investigator in the Solar System in his previous life. Abruptly revived from stasis in the starship Aeon, he agrees to join the unprecedented mission. When he fled from Earth on Aeon, what he expected to find on the other side of the stars wasn’t an interstellar accident scene like this. Or a woman like Zilka. Always as singularly alone as she was brilliant, Zilka discovers that this can change. But first she has to learn how to lead a very assorted crew. And Jack has to learn to follow his heart. Soon all of them will discover how death and life, hell and hope, and danger and love intersect in the Starcross Nebula. 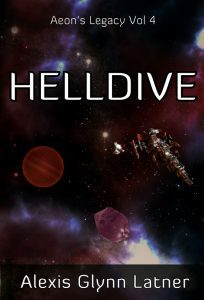 Helldive is available for Kindle as well as Apple iBooks and Nook, with a print edition at Amazon! Modern sailplanes may be the most beautiful machines the world has ever seen. What they can do is amazing enough to be fantasy—but it’s fact. And in futures real and imagined, they could fly in stranger skies on other worlds. 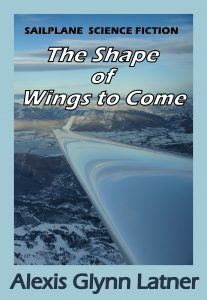 Five previously published tales of science fiction and science fantasy, plus a futuristic fact article, describe The Shape of Wings to Come. Available as an e-book for Kindle and other e-book readers and as a print edition from Amazon. The final journey of the starship Aeon has reached yet another world—a hopeful new beginning after the disastrous events in Downfall Tide. The first generation of colonists from Earth either perished or had to be left behind. Now their children encounter wonders and terrors, monstrous aliens and marvelous allies, in a place stranger than anything they ever imagined. It’s like a Bermuda Triangle in space . . . half as old as time. But even here, faith and hope endure, and love is stronger than death. 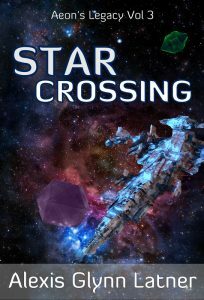 Star Crossing is available as an e-book for Amazon Kindle, at Apple iBooks, Barnes & Noble Nook, Inktera, Kobo and Scribd, with a print edition from Amazon. It has been twenty-four years since Planet Green was colonized by the starship Aeon. In that time much has changed, thanks to unremitting hard work by the first generation of astronauts, scientists and explorers. 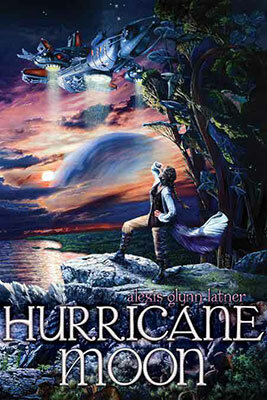 They have built the beginning of a new civilization on that distant world with its ocean-covered hurricane moon. Unknown to them and their children, everything is about to change. 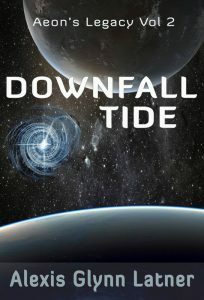 Downfall Tide is available as an e-book for Amazon Kindle, at Apple iBooks, Barnes & Noble Nook, Inktera, Kobo and Scribd, with a print edition from Amazon. In the late 21st century, with Earth wracked by climate change, an ambitious private foundation launches a starship to find a new world. Aboard the starship Aeon are Catharin Gault, an idealistic astronaut-physician, and Joseph Devreze, a geneticist asbrilliant as he is irresponsible. Aeon discovers two Earth-sized planets in orbit around each other. Planet Green has abundant plant life. Planet Blue is an oceanic world covered with hurricanes. The green world with its bright blue moon seems like a perfect stage for the drama of civilization to begin anew and turn out better this time. But the journey took too long. A millennium of cryostasis—cold suspended animation—has caused insidious genetic damage. Now Catharin must rely on the irresponsible genius Devreze to help her repair the human genome if there is to be a future for the colony on Planet Green. Their mutual attraction ratchets up even as their conflict escalates. Together Catharin and Joe must decide how they can face, and embrace, a future utterly at odds with Aeon’s planned mission and their own expectations. 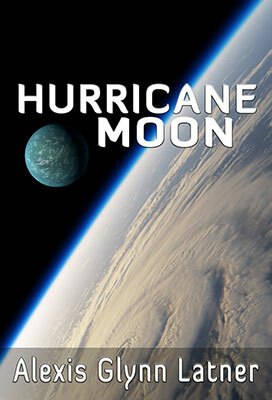 Hurricane Moon is available as an e-book for Amazon Kindle, at Apple iBooks, Barnes & Noble Nook, Inktera, Kobo and Scribd. I have copies of the original trade paperback. Please contact me about obtaining an autographed copy.